Autumn Moor GrassEvergreen grass. Clumping growth habit. Tolerant of many soil types. White plume in..
Blue Moor GrassEvergreen grass. Clumping growth habit. Purple plume in Spring. Tolerant of many soil..
Blue Moor GrassEvergreen grass. Clumping growth habit. Tolerant of many soil types. 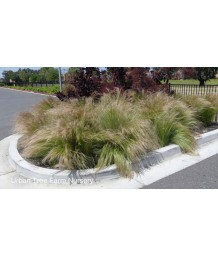 Purple plume in ..
Alkali Sacaton/Dropseed GrassDeciduous perennial grass. Leaves are grayish-green during growing seas.. Giant SacatonDeciduous perennial grass. Leaves are grayish-green during growing season, yellow in fa..
Pheasant Grass/New Zealand Wind GrassEvergreen grass. This evergreen species makes a handsome specim.. Giant Feather GrassEvergreen grass. Densely mounding growing habit with narrow arching gray-green fo..
Peruvian Feather GrassPerennial grass. Fine textured green foliage forms an upright clump. Fluffy cr..